It’s still the biggest change ever to hit the film industry. The coming of sound changed the way films were made, and shown. It affected the livelihoods of actors, technicians, producers, musicians and cinema owners. This period of change, in which some filmmakers rose to the challenge and others struggled with the new technology is one of the most fascinating periods in cinema history. For the past three years, a research project led by British Silent Film Festival co-director Laraine Porter has been delving into this process of disruption and reinvention, as experienced by the British film industry. Sound came a little later to Britain than to the US. The first fully synchronised sound film to be released in this country was horror film The Terror, in November 1928. The following year, studios and cinemas hurriedly mobilised to accommodate the “Talker Wave” and by the time Hitchcock had released his Blackmail in both silent and talkie versions, the industry knew it would have to enter the 1930s wired for sound. Two years ago, the 18th British Silent Film Festival shared some of Porter and her team’s research, and several of the country’s first, occasionally faltering, sound films were shown. At this year’s festival, we’ll be finding out even more about the transition to sound. The five-day event opens with a one-day colloquium of papers and screenings, and then through the following days we’ll be showing some more assured early British sound films, which show studios and staff adapting to the new medium with greater confidence and more advanced technology. Archive silent film is rarely perfect. Age weathers all things, but especially nitrate film stock, which decomposes and distorts in the most alarming way. Watching a damaged print, you will likely see sections of the frame swallowed up by black or grey blooms, figures twisted, pock-marks raining across the image. Experimental film-maker Bill Morrison has made a career out of savouring the beauty in these warped and wrecked reels. His work takes archive film and turns it into not just a history lesson, but a work of art in its own right. You may already be familiar with his haunting 2002 feature, Decasia, a collage of film footage haunted by the shadows and spectres of nitrate decay. We all fervently wish the damage weren’t there, of course, but we can also be awed by it. Betty Balfour could well be the mascot of the 19th British Silent Film Festival. You will see her in three different films across the weekend – two silents and a musical. In each film, you’ll get a glimpse of why she was once one of the most popular British film stars. In her heyday, she was occasionally compared to Hollywood’s Mary Pickford, but her appeal was not quite so girlish and innocent. Balfour was first and foremost a comedienne, with an earthy, active charm that she deployed to great effect playing the Cockney flowergirl ‘Squibs’ in a series of hit films. Later in her career, she played more sophisticated characters in more serious films, but the Balfour charm still shines through. Balfour was not a Cockney herself, although she was raised in London. As a profile on Balfour in Picturegoer in 1924 wrote, “‘Squibs’ was a rough-cast, ragged, little East-Ender and Betty is a smartly-attired, highly-polished little West-Ender.” In fact, when Balfour had introduced herself to the readers of that magazine in 1921, in an article entitled ‘Mainly about me’, she stressed her aristocratic connections. The patronage of the “late lady FitzGeorge” was responsible for her big break, she explained, her first stage job at the Ambassadors’ Theatre in 1914, when she was just 12 years old. As a younger child she had performed songs and recited speeches at “At-homes” to an audience comprising “crowned heads, princes, duchesses; men who had helped to make empires, and men who were planning to wreck them”. A spectacular evening of silent film adaptions from Edgar Allan Poe’s classic horror stories, including: The Fall of the House of Usher (James Sibley Watson and Melville Webber, US, 1928), which tells the story of a brother and sister living (or not) under a family curse; The Tell-tale Heart (Charles Klein, US, 1928), a story of insanity and murder; plus Prelude (Castleton Knight, UK, 1927) taken from Poe’s story ‘Buried Alive’. 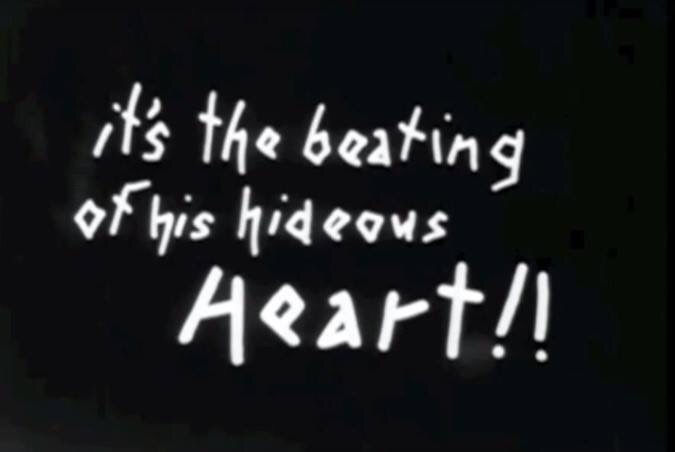 The programme includes the classic animated short, another version of The Tell-Tale Heart (Ted Parmalee, US, 1954) narrated by James Mason at his sinister best. Bryony Dixon (silent film curator, BFI) will introduce the evening with a reading from Poe. All silent films will be accompanied with live music played on the church organ, the piano and effects by the Festival’s world-renowned silent film musicians, Neil Brand, Phil Carli, Stephen Horne and John Sweeney. Available from Phoenix, or on the door, but advance booking is recommended to avoid disappointment! The British Silent Film Festival returns to the Phoenix in Leicester this September and the good news is that you can book your tickets and passes now. We are excited to unveil our four-day programme of silent and early sound cinema from around the world – with a special focus on British film. All the silent films will be accompanied by some of the world’s best silent film musicians, including a very special score for Vampyr, by Stephen Horne and Minima. This haunting, hallucinatory horror film was directed by Carl Th Dreyer in 1932 with barely any dialogue. It is based on the writings of Sheridan le Fanu and follows a young scholar of the occult who enters a village that is under the curse of a vampire. More silent horror in the programme comes courtesy of a selection of chilling films inspired by Edgar Allan Poe, which will screen at Leicester’s atmospheric 12th-century St Mary de Castro church, with an introduction from BFI curator Bryony Dixon. We’ll also be celebrating some of the silent era’s lesser-sung comedians. We are screening the hilarious Hands Up! in which comic Raymond Griffith plays a Confederate spy trying to capture some Yankee gold during the American Civil War. We are also showing Cocktails, a rarely seen, sparkling comedy from 1928 starring Pat and Patachon, the “Danish Laurel and Hardy”. A rarely seen treasure of silent cinema, L’Hirondelle et la mésange, directed by André Antoine in 1920, also screens at the festival. This lyrical, suspenseful film, set in the canals of Flanders, and taking its name from two barges driven by the protagonists, was not released for 60 years as the studio considered it too realistic. Now its naturalistic acting, and sophisticated camera effects are celebrated as an example of silent cinema at its finest. This film has been restored by La Cinémathèque française, and we are showing the film in a gorgeous 2K restoration, complete with the original tints. It wouldn’t be a celebration of British silent cinema without Alfred Hitchcock, and we’ll be showing the recent BFI restoration of his debut film The Pleasure Garden, with an introduction by musician, composer and TV presenter Neil Brand. Again we’re looking at British cinema’s transition from the silent era to the talkies. We are screening some early sound classics, including Walter Summers’ nail-biting Suspense (1930) in which a group of British WWI soldiers are forced to listen to the enemy laying mines in the tunnel beneath their trench. This brilliant film will be introduced by journalist and film researcher Geoff Brown. There is plenty more in the full programme, which we’ll be announcing in full soon, including some fascinating archive film, two appearances by Betty Balfour, and Bill Morrison’s acclaimed documentary, Dawson City: Frozen Time. Don’t forget, the festival kicks off on 13 September with a one-day colloquium on Silent Cinema and the Transition to Sound – see the at a glance timetable for the papers and presenters! The British Silent Film Festival runs from 13-17 September 2017 at the Phoenix Arts Centre in Leicester. You can book weekend passes here.